While swinging from his toes and shooting from his hips. 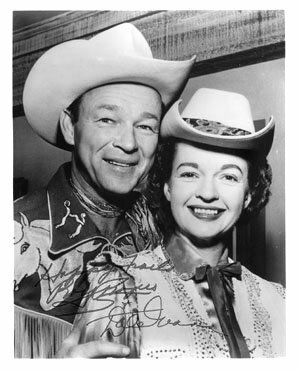 Roy Rogers battles foes with a song upon his lips. It's defiantly a lot easier than reading those movie scripts. Or otherwise he would be relegated to eating fish and chips. Nah! That doesn't make any sense, does it? So just sit back, relax, and watch the following 75 minute movie made in 1947. It was Directed by: William Witney; and Co-Starred: Dale Evans, Andy Devine, with John McGuire. As I lie here upon the ground, battered, bruised, and desperately seeking revenge, somewhere nearby I can hear my own friend Bullfincher (Andy Devine) calling out to my name. Encoring me to get up and fight back against Gridley (John McGuire) and his men. But for some strange reason my mind seems to falter somehow. And it drifts back to when I first saw that lady a couple of days ago. Why is that though? Is it because -- as I suspect -- she is in fact that famous author who goes by the name of Lee Madison (Dale Evans)? And if she is, why is she hiding this knowledge from the rest of us? Could it be because she overheard my pals saying what I thought about her literary profession? Anyway. I suppose this elusive train of thought shouldn't be my top priority at the moment. I'm Roy Rogers (Roy Rogers). And what I should be concentrating on is getting up, getting ready, and trying my damndest to figure out what Gridley is hiding in that mine shaft way out of town. Then again, that's most probably why what next transpires all get mightily peculiar when an English man seeks out someone by another name. As a revelation is made - a bad-guy gets played - Trigger isn't afraid - and at the end of the day, everyone finally comes out, fresh from the shade. 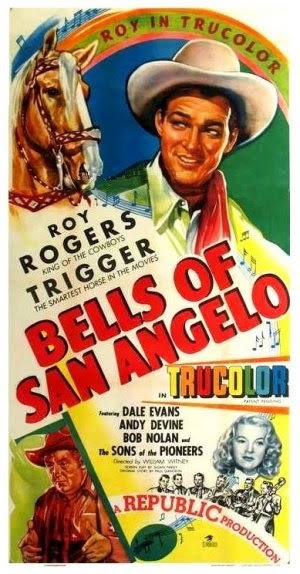 I'd say from a narrative point of view the 'Bells of San Angelo' reminds me of an actual church bell swinging in the breeze. When the bell swings one way, the plot concentrates on Roy figuring out what Gridley is doing with that mind shaft. When the bell swings the other way, the plot then concentrates on Lee hiding her true identity. And when the bell finally clangs, the plot goes a bit funny, and concentrates on that whole Bullfincher scenario. Yep. That's right, folks. In many ways this is a fairly flimflam film. And I'd go so far as to state that this doesn't necessarily make it a bad thing at all. Well, the way I see it, this wholesome western is saved from this garbled structure because it instills into the central premise so much fun. First you have the great music. Then you have the occasional humor. And on top of all that, you have the fighting, the singing, and the general horse play between the characters. What I enjoyed about it the most was how every single one of the main players had something to do or say throughout the course of the movie. If one of them was having a joke at someone else's expense, the others always had something to interject or comment on thereafter. Also, as much as I wasn't very keen on those two sub-plots at first -- those being the Lee and the Bullfincher sub-plots -- as the adventure then rolled on these story-strands still managed to make their way back into the narrative, and they did it in a very easy going and simple fashion. And do you know what, my friends? Funnily enough, 'easy going' would be an appropriate phrase to label this film with. The acting style was easy going. The flow of the tale was easy going. And by in large the ambiance of the overall production was easy going too. Never once did I ever question why x did y, because somehow this flick charmed me with its clean-living spirit. Admittedly, I wasn't too thrilled with how this western took quite a bit of time for the story to take root. As a matter a fact, I'd estimate that it took roughly twenty minutes before I kind of figured out what it was all about. But apart from that though -- hey -- this was one hell of a great film -- and these are its facts. (1) 'Republic Pictures' first released this production on the exact same day Jackie Robinson became the first African-American to play in 'US major league baseball'. It was on the 15th of April, 1947. (2) Loosely translated, this project was entitled 'Bells of Rosarita' in Spain; plus 'San Angelo Watches' in Finland and Sweden. (3) The majority of this movie was shot on location within the American state of Nevada. This includes Red Rock Canyon, Goodsprings, plus the Valley of Fire State Park, located in Overton. (4) One of the taglines used to promote this picture, was, 'Ring the bells...Roy's ridin' to a new Trucolor Adventure!'. (5) Excerpts from this film can be seen in the 1976 Rex Allen comedy-western, 'Meanwhile, Back at the Ranch'. (6) Some of the songs heard in this shindig were composed by John Elliot, and he has written over six hundred songs throughout his seventy year career. 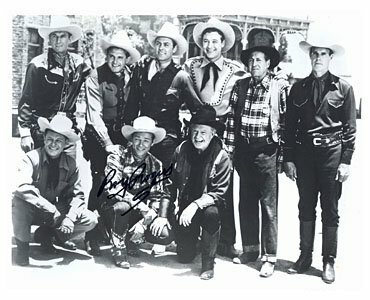 (7) William Witney, who directed this western, has also directed numerous episodes of such popular television series as 'Bonanza', 'Tarzan', 'The High Chaparral', 'The Virginian', and 'Wagon Train'. (8) After this adventure did a spot of voguing, Roy Rogers starred in his next film, 'Springtime in the Sierras'; Dale Evans starred in adventure, 'The Trespasser'; and Andy Devine starred in this western, 'The Vigilantes Return'. 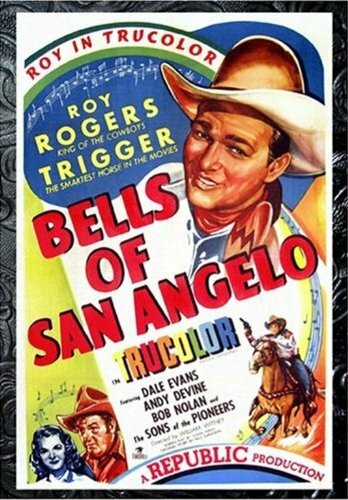 Now if you excuse the obvious pun, overall I'd say the 'Bells of San Angelo' struck a nice chord with me, as it was well acted and well presented, even though it did drop a couple of clangers in the narrative department now and again.